We read Dr. Seuss's ABC. Later I pulled out Epsom salts for some sensory exploration on the light box. JZ (5) is the king of scooping things in his hands and letting them run through his fingers. J-Bug (3) cautiously ran his fingers through the salts. The he squealed, "Look what I made, Mommy! An X, an X!" I love when I have an idea for an activity, and my kids take it in that direction without any prompting. They each took turns writing letters and experimenting with the texture. 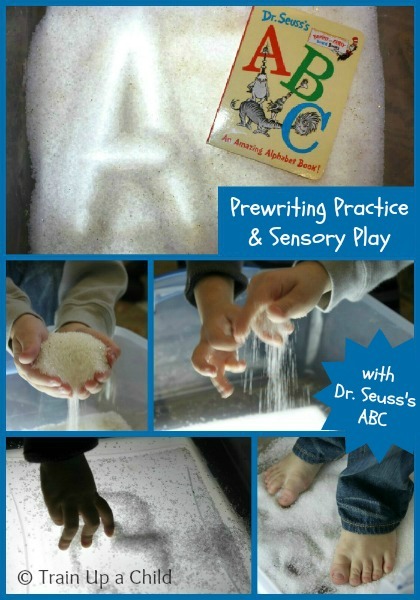 Writing letters in salt or with other sensory materials is a wonderful prewriting exercise. It helps children learn and practice letter formation without forming bad habits like an improper pencil grip or pushing muscles that don't yet have the fine motor skills needed to write with pencil and paper. J-Bug wanted to try, too. Then J-Bug ran off to get some glitter. 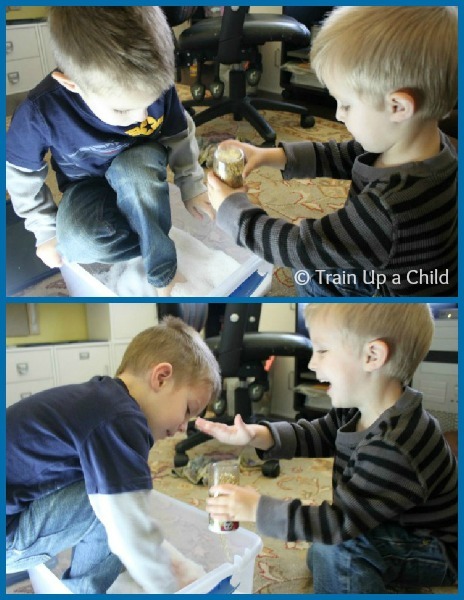 Both boys loved seeing the shimmer of the gold glitter mixed in with the white salts. Whenever it's really quiet during a sensory activity I know they are really taking it all in. *UPDATE* Almost a year later this is still a favorite activity. We still have that same bag of Epsom salt with gold glitter. I store it in a Ziploc baggie when not in use. For more prewriting and alphabet learning ideas check out my ABC Activities board on Pinterest. Thanks so much for linking up to my "Hop-on-Seuss" party. I just pinned/tweeted your article! I love how you let them add the glitter and get their toes in it! Both things reminded me of my 4-year-old! And besides, adding glitter to the salt is a really great idea!